The minimum IBPS eligibility requirement was just a pass in matriculation with 60 percent marks, when the IBPS recruitment began in 2011. Later, IBPS revised the eligibility conditions for PO, Clerk, RRB, and Specialist exams in 2013 and 2015. As of 2018, a bachelor’s degree is the standard qualification for anyone applying for IBPS Exam in India. Regarding the upper and lower age-limit, it is a changing factor as relaxations apply to some candidates. Planning to participate in IBPS Recruitment 2018? Find the latest IBPS eligibility details below. Before we go deep into the IBPS eligibility for each category of recruitment, check out the conditions on citizenship. The following requirements are applicable for all IBPS Bank exams. Candidates from Nepal and Bhutan are eligible to take IBPS Exam as per the current laws. However, they have to get an eligibility certificate from the Indian embassy of their nation. Refugees and decedents of migrants are also eligible if they could provide relevant documents. For some banks degree with at-least 60 percentage marks is a must appearing their probationary officer (PO) exams. They include this clause when they conduct their own recruitments. IBPS has also made such a change in the past for PO recruitment but reverted it back after protests from candidates. Yes, a pass in degree is the minimum educational qualification for applying IBPS PO. And as of now, there isn’t any percentage requirement for graduation. The number of your backlogs or anything like is not a factor as long as you have the degree certificate with you, on or before the last of the online application. The institute had 20-28 as the age-limit for IBPS PO applicants in 2013. Later the upper age limit got a revise to 30 to include more PO aspirants from the general category. Candidates with reservation benefit get further privilege on age-limit as in the screenshot, below. The age is calculated as on the first day of the month when the IBPS PO recruitment registration happens. Last year it was 01-08-2017. It is IBPS Clerk recruitment, which once had “a pass in class 10” as the educational qualification. The clerical cadre comes below the PO when you take the rank. However, IBPS has a few additional eligibility requirements for the Clerk applicants. 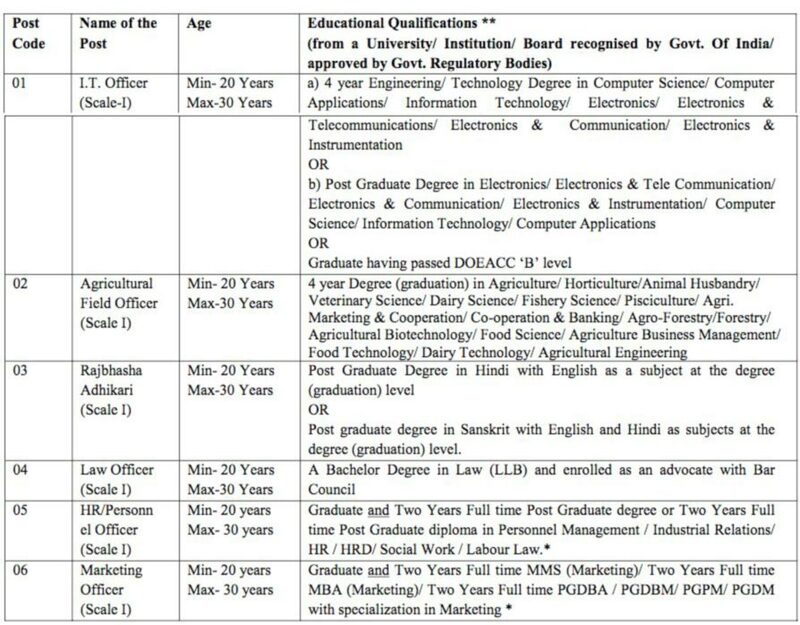 Educational Eligibility criteria for IBPS Clerk in 2018: Degree & Computer literacy. Computer literacy is a must as per the eligibility norms for IBPS Clerk Exam. Candidates need to bring a certificate confirming their computer knowledge if they get the selection to the clerical vacancy. It is enough if you have studied a computer subject in your degree or +12 level. Although not mandatory, proficiency in the local language is also a preferred qualification. Those who complete 20 years as on the first day of IBPS Clerk registration 2018 are eligible. There is also a relaxation on the upper age-limit for deserving candidates as per the following table. This benefit is cumulative for all IBPS recruitments. That means if you’re a differently-abled candidate belonging to SC/SC community the maximum age-limit for applying IBPS Clerk adds up to 5+10+28=43. SO (Specialist Officer) is also a manager grade position in Indian banks. Unlike PO and Clerk, they are not the persons you meet at a bank branch on a day to day basis. They work in the back-end under various roles. Educational eligibility criteria for IBPS SO in 2018: Professional degree & Computer Knowledge. IBPS Specialist Officer age Limit: 20-30. Computer knowledge is a must for all IBPS specialist Officer vacancies except for the IT officer post. Hence, as you see in the screenshot, the eligibility requirements for IBPS Specialist is distinct from PO, and other posts in the same class. It is the best career option for engineers and other professionals who like to work in the banking domain. The IBPS PO, Clerk, and SO recruitments select candidates to public sector banks, which have branches across the nation. IBPS RRB recruitment, on the other hand, is a specialized selection for another banking sector in India, the Rural Banks. The RRB recruitment also hires clerks, managers, and officers to Gramin Banks but through an all-in-one registration process. There is only a single notification for all cadres under this recruitment, and date for online application is also the same. 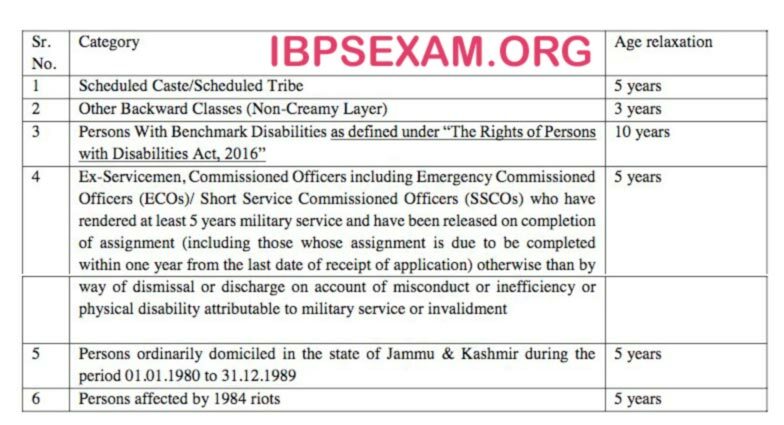 IBPS recruits personnel to about six different posts under this recruitment. The employee scales and grades in RRBs are a bit different from the regular banks, just like the eligibility conditions. 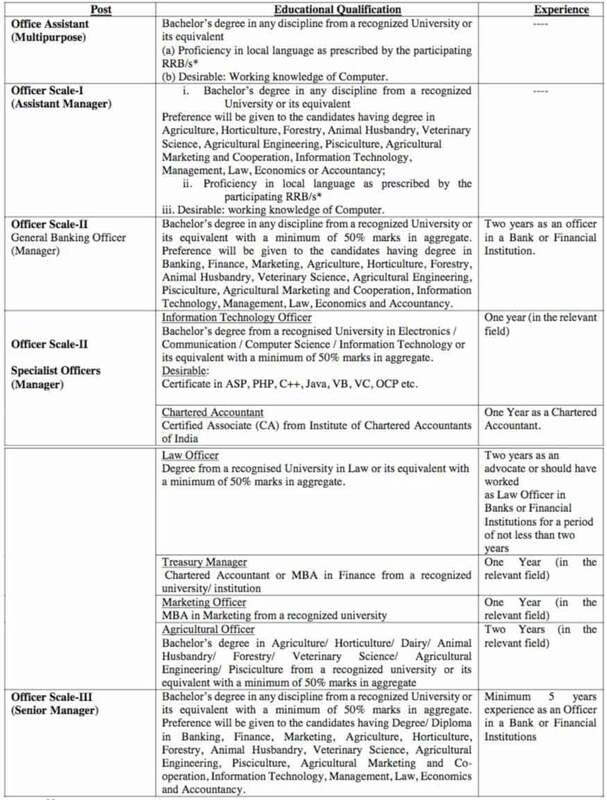 While graduation is the standard qualification norm, At least 50 percent mark is required for applying senior officer posts. Work experience is also a must for some categories. A candidate may register for the Assistant (Clerk) and one of the Officer vacancies in the list. And that if he or she is eligible as per the education and age requirements. An interesting fact about the IBPS RRB recruitment is the minimum age limit of 18 yrs for Assistant and Officer Scale-I. However, it useless as you need at least 20 yrs to complete a degree course. The birth date for IBPS RRB applicants is taken as on the first day of the month for online registration. For 2018, it is 01-06-2018. Check out some common doubts that our visitors have on IBPS PO, Clerk, SO and RRB eligibility criteria in 2018. My friend told me that I need at least 60 percentage in graduation to be eligible for IBPS exam. Is that true? It is clear from the article, “percentage requirement” is only applicable for IBPS RRB recruitment. And that too for some senior officer roles. Your percentage in graduation doesn’t matter if you are focusing on IBPS Clerk, PO or Specialist Officer (SO) cadres. I have a few backlogs and supplementary papers. Am I eligible to participate in the IBPS selection process? No issues. However, you have to clear all backlogs and get the result before the last date of online registration. Looks like I’m eligible for IBPS recruitment 2018 as per the above criteria. What is the next step? If you’re eligible, check the details and apply online for the ongoing IBPS Exams from our page. How to the get certificate formats for proving my eligibility under disability category and reservation? IBPS notification includes the formats for eligibility certificates. Scroll down towards the end of the PDF file. I completed my degree course under distance education scheme. I’m I eligible for IBPS exam 2018? All UGC approved universities are accepted for IBPS registrations. A list of UGC and IBPS recognized universities for distance education is here. Anything else? Don’t hesitate to ask your doubts on IBPS eligibility in 2018, in the comment section below. HELLO EVERYONE. SOME OF MY FRIENDS WERE SAYING THAT I SHOULD HAVE AGGREGATE 60% IN GRADUATION THEN ONLY I CAN APPLY FOR BANK EXAMINATION. SO I WANT TO MAKE SURE THAT CAN I APPLY FOR BANK EXAMINATION. AFTER ALL, I HAVE SCORED AN AGGREGATE OF 59%. Sir I was a candidate of Directorate Of Distance Education(D.D.E). This college comes under Patna University. D.D.E is a distance college. My session is between 2015-18. But this college didn’t get registration at the end of 2016 for further new admissions. Is am eligible for ibps exam? Unfortunately, as far as I know, IBPS takes the current status (approval) of the university for eligibility. Sir I completed my Bcom graduation and PG in MBA marketing, But not in regular it’s from distance mode. Am I eligible for the ibps po and so posts. May I know from which university you got your degree? Candidates are eligible for IBPS exam if they complete educational requirement from UGC approved institutions. A list of approved universities is given above. I completed my degree (BSc.Game design and development) in distinct education (from Tamil Nadu). The certificate is provided under the Birmingham City university. Am I qualified to apply…? hello presently am pursuing my B.Tech (4th-1st semester) .can i apply for the exam?